Flying Pony in Little India serves up its coffee and baked goods with a side of fine art as it also pulls double duty as a contemporary art gallery. 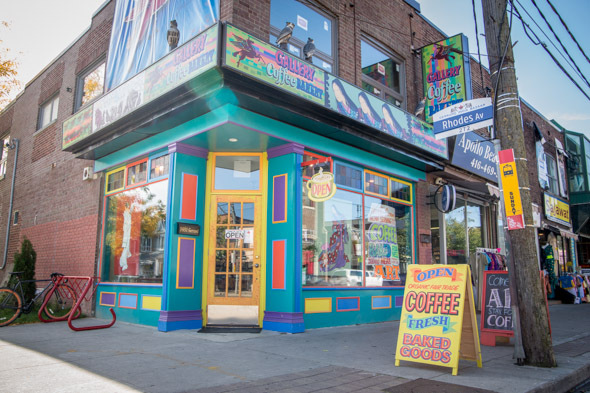 Any associations you may have of 'art gallery' with 'stark' or 'stuffy' should quickly fade away once you catch sight of the cafe's multi-coloured exterior and cheerful yellow door. The coffee shop combines owner Andrew Horne's two passions of coffee and art. An artist himself, Horne exhibits the work of a different artist each month in the space, including artists he knows personally or those he discovers at art shows. He hopes to make fine art accessible for people who may not frequent galleries, and is happy for people to simply come by to take a look. "You don't have to buy a coffee or anything," he tells me. I, however, arrive with full intention of getting some coffee. Flying Pony uses its own blends of Central American, Bolivian and Ethiopian fair trade organic beans, which are custom roasted locally. From the menu of coffee drinks available, both hot and iced, I go for a double latte ($4 tax included), and it hits the spot. Topped with a healthy layer of stiff foam, the smooth drink delivers the rich, full-bodied espresso flavour I need to wake me from a grey sky-induced sleepiness. 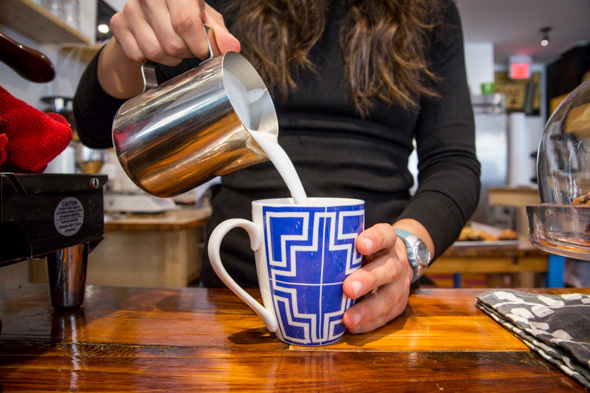 Roasted beans are also sold by the pound ($16-17/lb) and for you non-coffee drinkers out there, Flying Pony has a few beverage options, like hot chocolate and a London Fog. 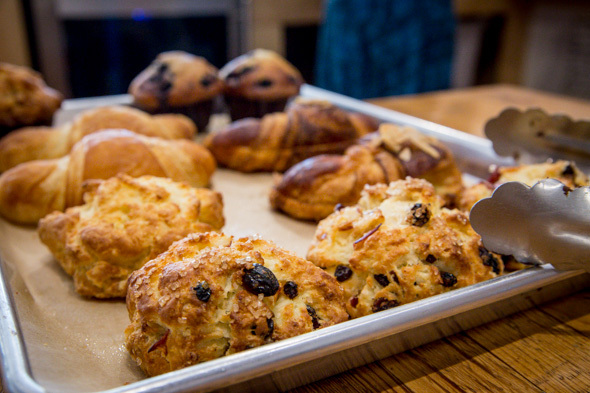 For something to nibble on, Flying Pony sells freshly baked goods, made in-store daily. Looking at the tempting selection of croissants, muffins (including a vegan banana pecan flavour), scones, cake slices, and pastries, I decide that the apple cranberry currant scone is calling my name ($2.50 tax included). The scone's crispy and golden brown outer crust, sprinkled with large sugar crystals, gives way as I bite into the pillowy soft dough. "We use tons of butter" in the baked goods, says Horne, but the buttery taste of my scone isn't too heavy. The added fruit provides the hint of sweetness I want, but given my mad love for autumn apple season, I could've gone for a few more apple bits mixed into the dough. 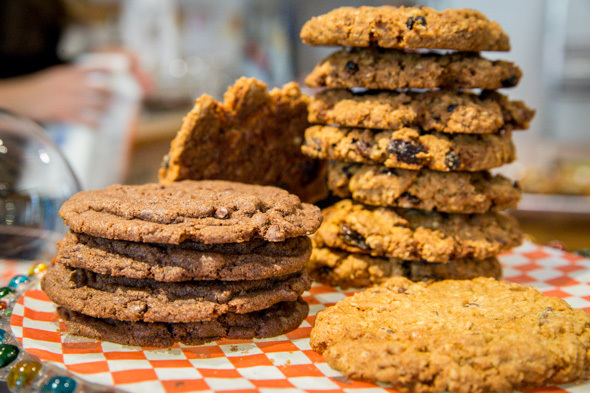 I have to head back up to the baked goods display, and eagerly swap a loonie for one of the oatmeal chocolate chip cookies. The dark golden cookie offers a balanced amount of butter and rich chocolate flavours, and is chewy with a bit of crispiness. 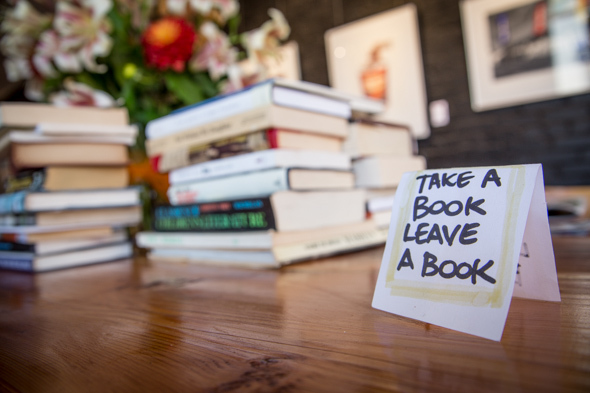 The sandwich board outside Flying Pony invites guests to come for the art and stay for the coffee, but I doubt I'm the only one who comes primarily to get their coffee fix, and finds themselves enjoying the artwork a bit more than expected. 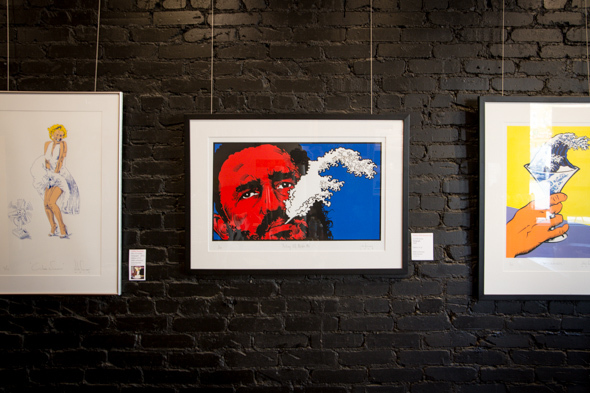 The black brick gallery wall and LED lights showcase the pop art-style serigraphs by Julio Ferrer, the artist featured this month, and I can't help but take a closer look. You can check out images of the art on Flying Pony's separate gallery-focused website . Rather than "packing it with tables," as he says, Horne wants to preserve space in the cafe for people to walk around and enjoy the art. 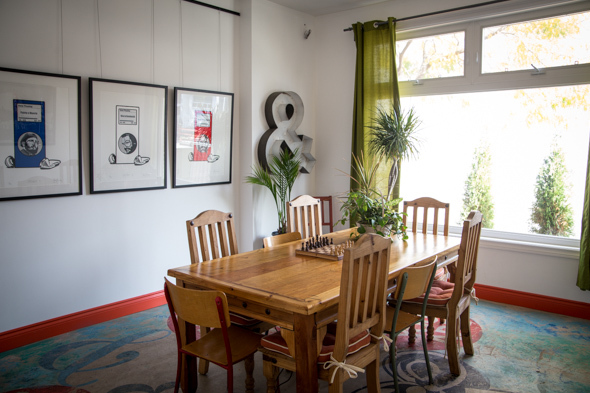 Nevertheless, seating is provided by a large eight-person wooden table, as well as a rose-coloured vintage sofa and a couple small tables with vintage kitchen chairs. There's also a nice room in the back with another large table, a big window, some artwork, and a quieter vibe. Flying Pony is cash-only and open daily 8am-6pm. Free WiFi is available.